Go the extra mile with the right tires at the right price, from Firestone Complete Auto Care. We're your local tire shop in Bartlesville, OK! When you need new tires in Bartlesville, you need Firestone Complete Auto Care. It doesn't matter whether you drive sports car or a family-friendly minivan, you'll find tires for less! 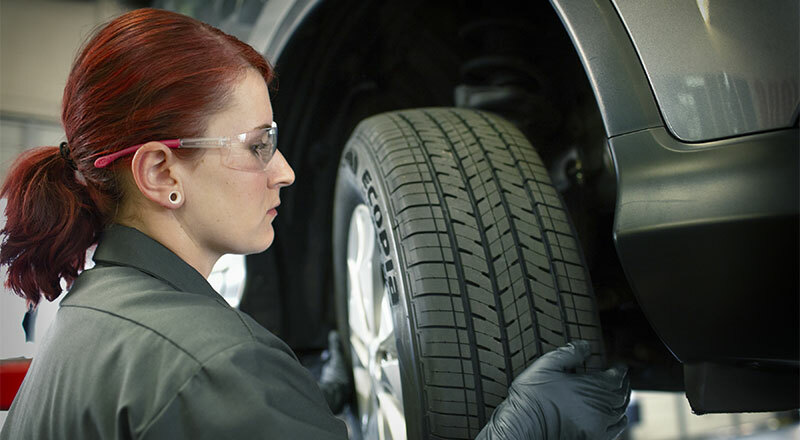 Our technicians will help you pick the best tires for your vehicle, driving style, and climate. Explore our wide catalog online and shop tires from some of the brands drivers trust most, Bridgestone and Firestone. Then schedule your installation at a time that's convenient for you! From studded winter tires to slick sport tires, Firestone Complete Auto Care has what your vehicle needs. Unsure if it's time to change your tires? Our experienced technicians can help, but you can do a quick inspection in your driveway too. Start by checking your tread wear. If the treads appear worn or shallow, your tires may not have enough grip to keep your vehicle on the road. That's a safety problem! You'll also want to look for tears, bumps, bulges, or sidewall cracks, and note your tire age. Even if your tread wear looks fine, vehicle manufacturers typically recommend replacing tires every 6 to 10 years. It can be matter of staying safe on the road, something that's very important to us at Firestone Complete Auto Care in Bartlesville. Take on Route 66 or a more fuel-efficient commute with the best tires for your car from Firestone Complete Auto Care. You'll get the size you need from the brands you trust most, like Firestone, Bridgestone, and Primewell. Put your confidence in us and you'll get more than professional recommendations and tire installation. You'll also receive complimentary tire pressure refills and tread checks, along with reliable flat tire repair, alignment, and rotation. We've been a choice tire shop in Bartlesville for many years, and a leading tire provider in the U.S. for close to a century. For handcrafted service you can trust, turn to Firestone Complete Auto Care. Browse tires online and schedule your installation today! From oil changes to batteries to headlight replacements, rely on your nearby Firestone Complete Auto Care for your car repair and maintenance services. We're an automotive shop, tire store, and car care center wrapped into one. Our highly qualified technicians work hard to help ensure that your vehicle runs the way it should. When you bring your car or truck to us for maintenance, we will strive to make your visit satisfying. Experience the difference and book an appointment online for auto service in Bartlesville, Oklahoma today.